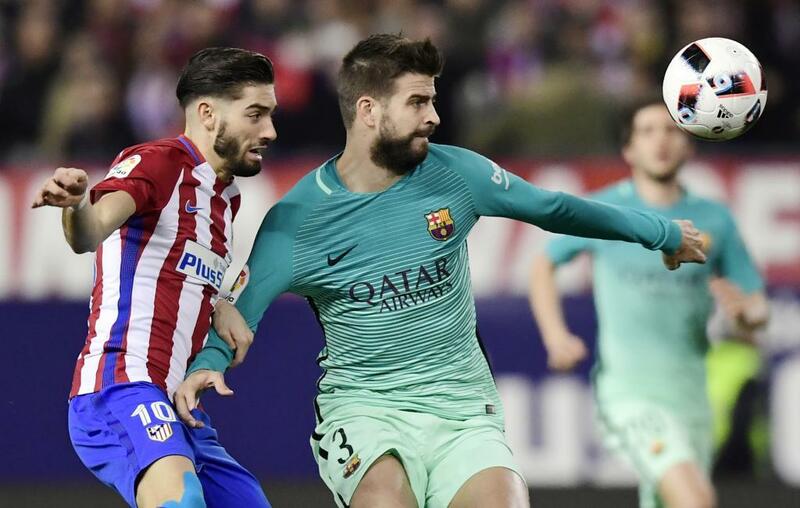 Barcelona moved a step closer to a fourth straight Copa del Rey final with a 2-1 semi-final second leg win over Atletico Madrid on Wednesday night at the Estadio Vicente Calderon in Madrid. 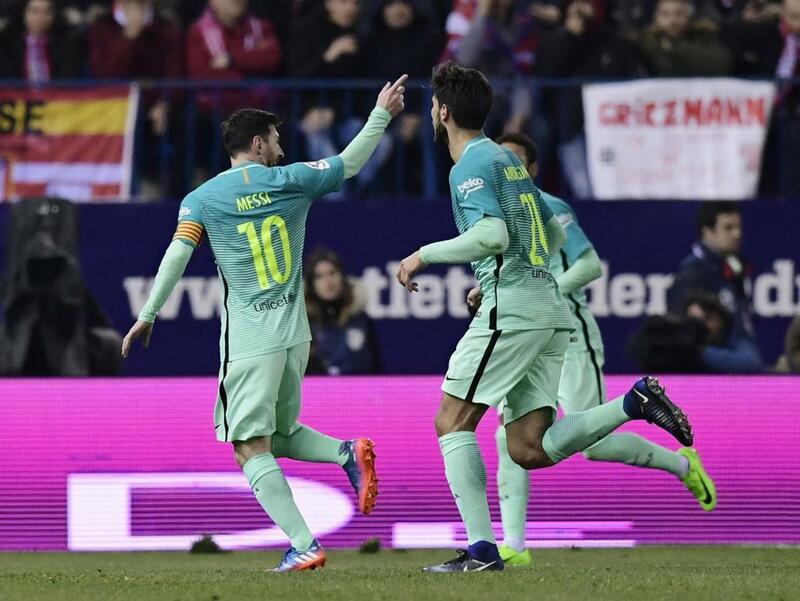 Luis Suarez and Lionel Messi each scored in brilliant fashion to lift the Catalonians to victory. 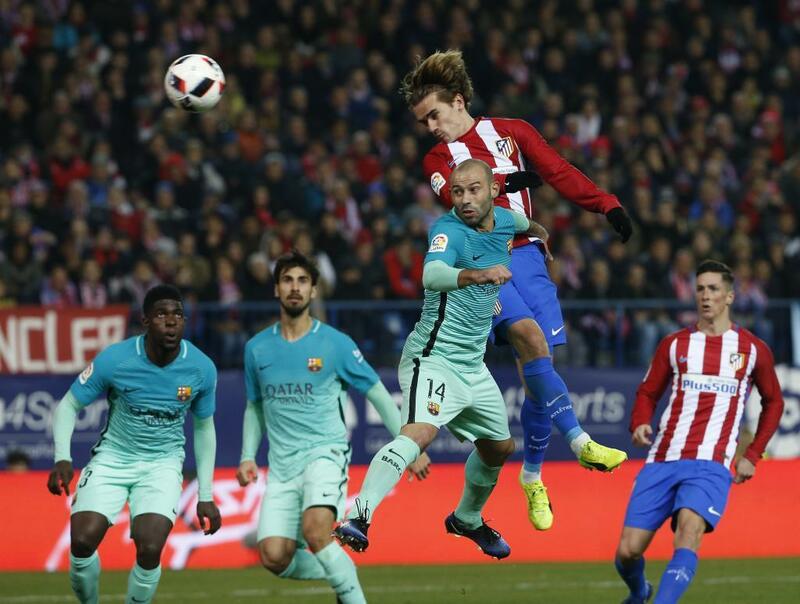 A second half header from Antoine Griezmann gave hope to Atletico heading into next week’s return leg at the Camp Nou. It is never dull when Barcelona and Atletico meet, and Wednesday night was no different. The stars came to shine, as all three goals were of great quality. The pace maintained by the two teams was breathless and the ruthless finishing from Suarez and Messi combined with Atletico’s ceaseless drive made for a thrilling contest. With Andres Iniesta and Sergio Busquets still unavailable due to injuries, Barcelona manager Barcelona manager Luis Enrique once again moved Javier Mascherano into midfield just like in last week’s quarterfinal return leg versus Real Sociedad. Joining the Argentine was Andre Gomes and Ivan Rakitic, who was selected ahead of Denis Suarez. Otherwise, there were no major changes from the Asturian in the Barcelona starting XI. As for Atletico, there were no major surprises from boss Diego Simeone, who opted for the strike pairing of Griezmann and Yannick Carrasco, a duo that had great success against Barcelona in last season’s Champions League. 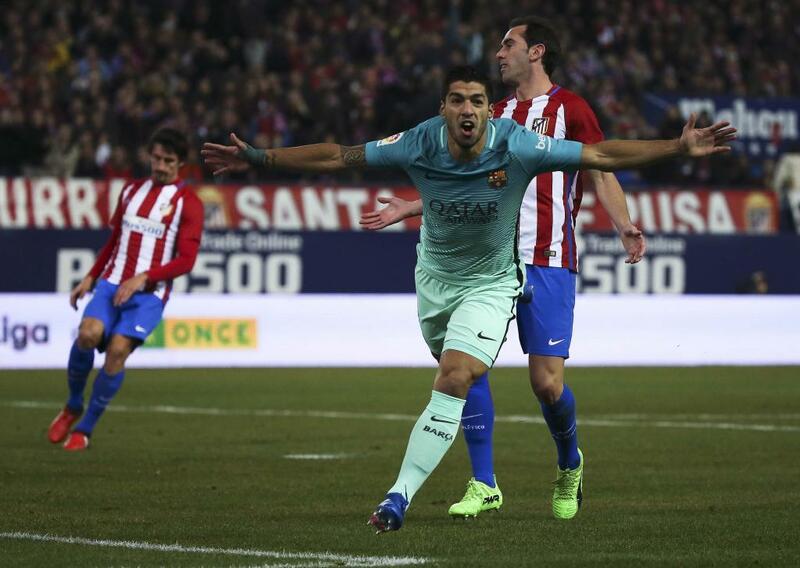 The atmosphere was electric inside the Calderon at kick-off, but Suarez was keen to quiet the home fans as quickly as possible and he did so with a spectacular goal to give Barcelona a 1-0 lead. Mascherano dispossessed in midfield and the ball rolled right to Suarez, who played a ball forward to himself by zipping past Stefan Savic using breathtaking speed a la the Brazilian Ronaldo before fending off Diego Godin’s challenge and slotting home past Atletico goalkeeper Miguel Angel Moya for the goal. Barcelona should have added a second goal when Suarez elected to play a pass back to Neymar when a left-footer from the Uruguayan would have been far more productive. 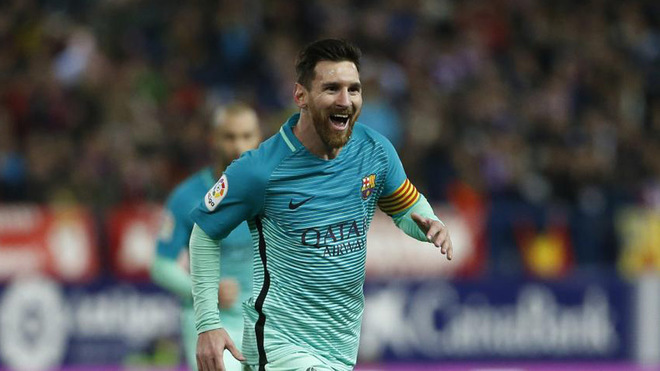 Barcelona’s first half then went from good to great thanks to an absolutely sensational strike from Messi that extended the lead to 2-0. The Argentine played a simple ball out wide right to Rakitic, who played it right back to Messi. Stationed outside the area, Messi moved to his left and uncorked a searing left-footer that banked off the inside of the far post and caromed into the net. Atletico were not about to go down quietly and Simeone had his troops fired up at the start of the second half. Los Colchoneros took the game to the Barcelona defence and by the hour mark they cut into the Barcelona lead with a goal drawn up on the training ground. Gabi lofted a free kick down the left to Godin, who headed across goal for Griezmann and the Frenchman finished off the play by converting a header from just a few metres out to make it a 2-1 affair. Barcelona felt that Griezmann had fouled Suarez in the act, but there was no whistle and the goal stood. With the boisterous crowd roaring them on, Atletico wanted more and if not for a fantastic save from Cillessen, Griezmann would have evened up the aggregate just minutes later. Unlike the first half, Barcelona looked nervous and uncomfortable playing the ball out from the back and the MSN were getting fewer touches, but when they did there was still danger for the Atletico defence to deal with. Messi almost scored another superb goal via a curling left-footed free kick, but Moya soared to his right and pushed the top-spinning shot away. Substitutes Kevin Gameiro and Fernando Torres had a number of good looks at a second Atletico goal in the final 10 minutes, but Gameiro’s scissor kick and two attempts from Torres failed to find the target. Griezmann then nearly replicated Messi’s goal with a stunning left-footer of his own, but the ball bounced wide. Despite the best efforts of the Calderon crowd, Atletico were unable to breach the Barcelona goal for a second time as Luis Enrique’s men hung on for the victory. Prior to next week’s second leg, Barcelona will return to league action on Saturday versus Athletic Bilbao.